I feel bad for anyone who has to learn English as a second language. There seems to be no rhyme or reason to the way it is set up. I would just shake my head and wonder what the percentage of dyslexic people there were in other countries. I was reading a while back about the history of the English language and learned that the confusion of the English as a language stems from linguists applying romantic principles to a germanic language. Had we, at the advent of the linguistic discipline, instead applied germanic rules, the confusion we have today might have been avoided. As interesting as that fact may be, you can only spend so much time bemoaning the apparent stupidity of the past. Eventually you have to figure out how to deal with the cards you have been dealt. 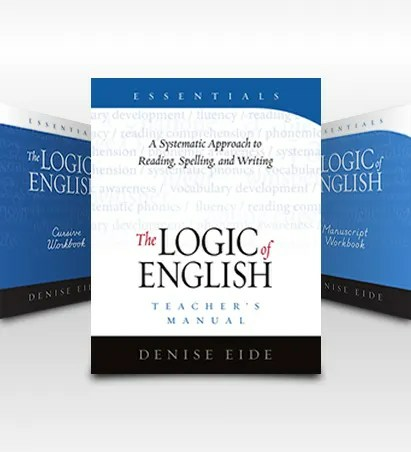 The Essentials curriculum from Logic of English is a language arts program that helps us make sense of the labyrinthian rules for the English Language. The Teacher’s Manual is (in my opinion) the most valuable piece of this program (but by no means, the only valuable piece). The first 70 pages are instructions for the teacher and include suggested lesson times, structures, and tips depending on the students age and reading/spelling level as well as a breakdown of the various parts of the Language Arts that it teaches; basic spelling rules, phonograms, and grammar rules; spelling lists; and how the lessons are set up. While Essentials is specifically geared towards ages eight and up, it also includes suggestions for emerging readers which are usually around the age of five or six. Each lesson has three parts. Part one is phonograms. This is where new sounds and their corresponding letters are introduced. Depending on the sound that is being taught, you may also teach the spelling rule that goes with it (for example the rule that since Q always needs a U, U does not act as a vowel in this instance). During part one you will also explore sounds. You and your child will compare the connection between how your mouth moves, tongue position, use of throat, etc. and the sound that you make. Part two is spelling. Here you practice spelling lists, dissect words, go over common spelling mistakes (which my children are fairly consistent in making), analyze the spelling of new words, and go over spelling rules. Part three is grammar. Here your child is introduced to the different parts of speech, conjugation, composition, sentence structure and vocabulary. Each lesson gives you a list of materials needed and is scripted for teaching ease. I can’t tell you how many times I have looked at different language arts programs and been frustrated with the fact that the different parts of language arts would be scattered across different companies and also be SO drawn out that after two or three years we are STILL having lessons on basic parts of speech. I would look a the price tag of five levels of spelling and four levels of grammar and think Why can’t we just have all of this info in ONE place! The Logic of English Essentials program is exactly what I have been looking for. The first thing I did when I got it was take my color coded post-its and mark the starting lessons for my three older children. The first day I tried it, I tried to follow the lesson plans exactly. It took doing that only once to realize that was not going to work well for our family. I had a few moments of panic before I remembered that I homeschool. Allow the customization to commence! There was no way Spencer (or Emma or Lucy for that matter) were going to sit through an hour long language lesson every day. Not going to happen. So, for him we just focused on the phonics portions. With Emma we focused mostly on writing and grammar. Lucy’s lessons were almost entirely just spelling. On the days I would teach language arts I would set everything I needed out for me at the table and would call the children in one at a time for their lesson. For the sake of simplicity, I would usually go from youngest to oldest. It was SO nice to be able to have three different levels worth of lessons without changing out my supplies. The supplement that was used the most often was the Phonograms App. After plugging in your child’s name and level it makes a sound and your child will touch the phonogram that makes that sound. It is simple yet effective. Now that you know what The Logic of English Essentials is, I should mention a few important points. The Logic of English Essentials is just that, the essentials. It will help you teach your children parts of speech, how to spell, reading, and sentence structure. It is VERY good on the basics and if completed your child will probably have no problem passing a test given on these subjects. What it does NOT teach is diction. As far as I have been able to tell, no language arts program does. It does not tell you when to use “take” and when to use “bring”, why you shouldn’t use double negatives, and when to use “whom” over “who”. It will not help your child sound learn to speak elegantly or sound educated in a conversation. As is the case with most curricula that cover several points, it can only go so deep into each. This should be able to get them through the SAT’s… but not necessarily a job interview. It will help them learn how to write, but not how to be a writer. I’m not even sure that diction falls under the category of “grammar” as I had always thought, but it is something that I still think is very important in the language arts. Diction is what separates William Shakespeare from Jeff Foxworthy (though I do love me a redneck joke ;)) It is what makes language an ART! I honestly don’t know if it’s even possible to teach diction in any way other than reading a wide variety of literature (and I’m not sure I would care to try it even if it is). 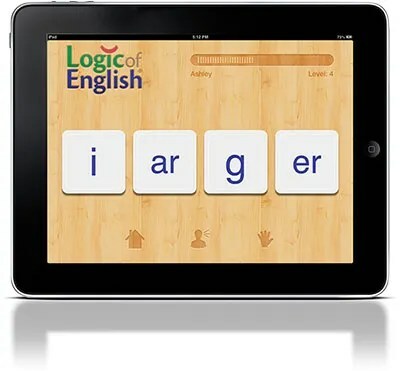 All of that being said, I found The Logic of English Essentials to be a very good program that will help your child learn the idiosyncrasies of the English Language in a logical and helpful way. Excellent review. I wish I could find something that taught diction as you mentioned as well. Love this review! We reviewed this last year when my daughter was 6 and after a couple lessons we realized she wasn’t getting all she could out of it. So I put it up for the year. I’m going to use it as her main 2nd grade English curriculum and I’m so excited! In the couple sections we did cover, I learned a lot!